Trying to get a turnbuckle wrench, anyone know which size fits the tc6 turnbuckles? I am currently a user of TC6 considering TC6.1 for my next ride. Since I have noticed ar mount of TC6 tend to have slop after few runs, just wonder if TC6.1 offset mounts have same issue(well, no issue if I do not hit anything...). It would be helpful if any of TC6.1 users share the feedback. Problem fixed I haven't looked back since! I have some dial a grips for sale if anyone is interested. Thanks. Ill consider dial a grip. I have been reading this thread page by page (in order to learn as much about my tc6.1 as possible) and I have been building my tc6.1 at the same time. I am now finished building my tc6.1 but I have a serious problem. I have used the search feature and found a few others with the same problem, but I was unable to ever find where they found a resolution. So, with that being said I would be greatly appreciative if anyone can help me. I just want to say that this is the first RC car I have ever built myself, so please cut me a little slack. I have an RC10T that I have had since I was 14, but my Dad had it built and gave it to me assembled. Also, I will be tidying the wires this was just a temp setup for testing. So, the problem that I am having is that with no wheels or tires on the vehicle I can be under full power and I can turn 100% left or right perfectly. However, when I put wheels and tires on the car it runs smooth at full power as long as I keep the wheels straight. Once I start to turn the wheels I can only get about 40% before I start getting a binding noise. After about 60% the car starts to shake violently. This occurs when I turn left or right. I have also posted 3 video's that I hope may be helpful. Any help would be greatly appreciated. Thanks in advance. youtube.com/watch?v=lhboy0pSwWs - In this one you can see how bad the car shakes when I turn. I can only guess that maybe my front bearings or CVD's are bad right out of the box? It won't let me post URL's because my post count it too low. You will have to add h t t p://w w w. - to the beginning of the Youtube links. Sorry. That's just chatter from running a spool in the front. The only way to really eliminate it is to run DCJ axles. Set your ride height and droop and the vibration will be alot less. Mine got better way better once I set it. Too much droop makes the cvd go at a much sharper angle which causes it to bind. Even with a little vibration I don't notice anything on the track. My TC6 shows a little vibration still. My TC6.1 has almost none. Where can I get DCJ axels? I googled it and found that they are called double cardan joint axels, but do you recommend a certain brand? I have already set my droop. I had a friend who races come over and verify my settings since I am new to this and he said I had done well. Now, ride height I have not adjusted yet. I will check that. Thank you. edit: Do you recommend the Reflex Racing Axel? RSD DCJ's have been working great for me. They are the closest thing to drop in thats out there. You just need a different hex and hex pin (RSD also sells these). what is the best starting point for the TC6.1 for running in VTA outside on med grip, soda treated track? Let me know what you figure out, that is exactly what I am racing as well! I just put together my tc6.1 and I get the impression I have a LOT of adjusting to do yet! Making the stock steering smoother ! There are posts from racers that feel that the stock steering system is not as smooth as a dual bell crank. We found a fix for it. 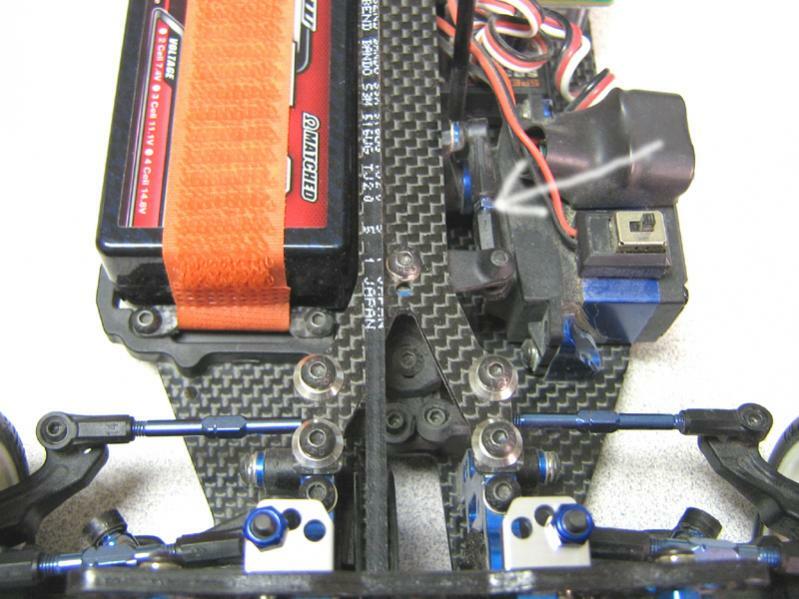 If you follow the installation instructions, it will position the servo close to the center of the chassis and this causes the servo linkage to bind because it is trying to operate at a kinked angle. 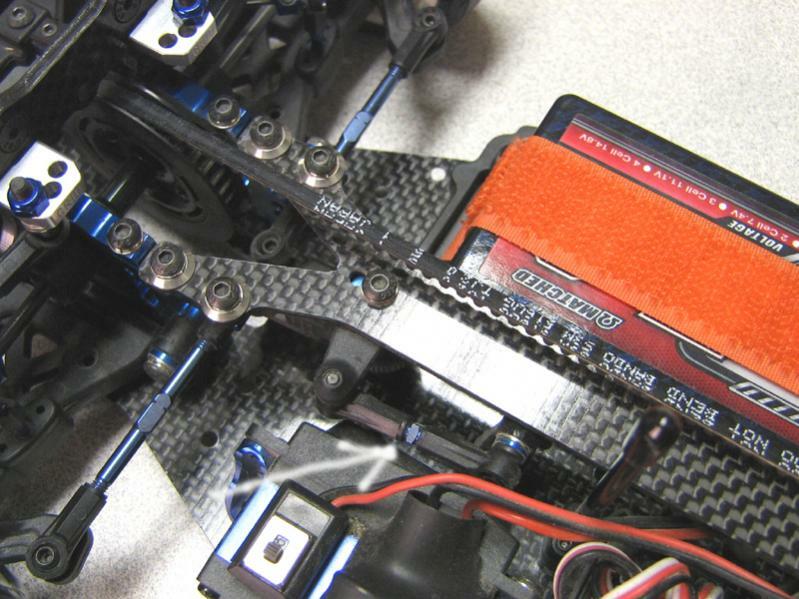 Try adding shims to the servo horn or position the servo away from the center of the chassis to get this servo linkage more parallel with the top deck. Moving the servo outwards slightly have no impact on the balance but greatly enhances how much smoother the steering will operate. As as to the slop, you can get rid of it by tapping a hole on the bottom of each front and rear hub just below the hinge pin and using a M3 set screw to eliminate the play. Lots of racers have done it. Last edited by Team Grid RC; 05-30-2012 at 07:24 PM.